It is never easy to be the driver in any car game, especially in this one, as you will have to carry some cargo in your trailer as well. The main thing is getting as many of the items to the unloading station without them breaking apart. Also you will be racing against the clock, because we all know that time is money and your boss will not be to pleased if you lose both cargo and lots of time on the track. Drive as safely as you can but keep your speed up if you want to reach the destination and get a star for arriving there within the time frame they allowed you. When you are at the end of the course, unload the cargo manually and try not to miss the boxes and other cargo pieces with the huge crane. Use the arrow keys to drive and Space to unload or load the cargo into your trailer. 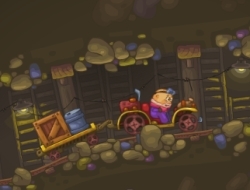 Mining Truck 2 8.00 between 0 and 10 based on 1 votes.